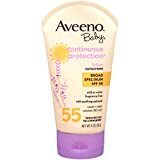 Aveeno Baby Continuous Protection Lotion Sunscreen with Broad Spectrum SPF 55 is sun protection that is as mild as water on your baby's skin. Specially formulated for babies, this lotion maintains broad spectrum protection, with skin-soothing natural oatmeal to care for baby's delicate skin. 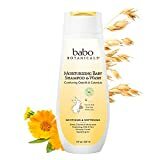 This non-greasy, fragrance-free, natural oatmeal formula helps prevent moisture loss and is water resistant for 80 minutes.